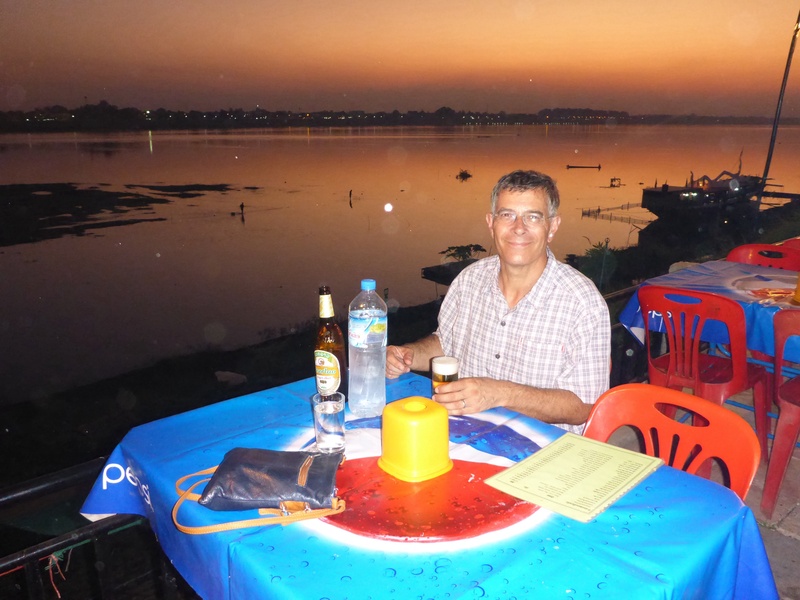 In the fading early evening light we gaze out across the Mekong river, from where we sit having dinner at a street restaurant in Vientiane, at the road in Thailand which we hitchhiked along some 28 years previously! 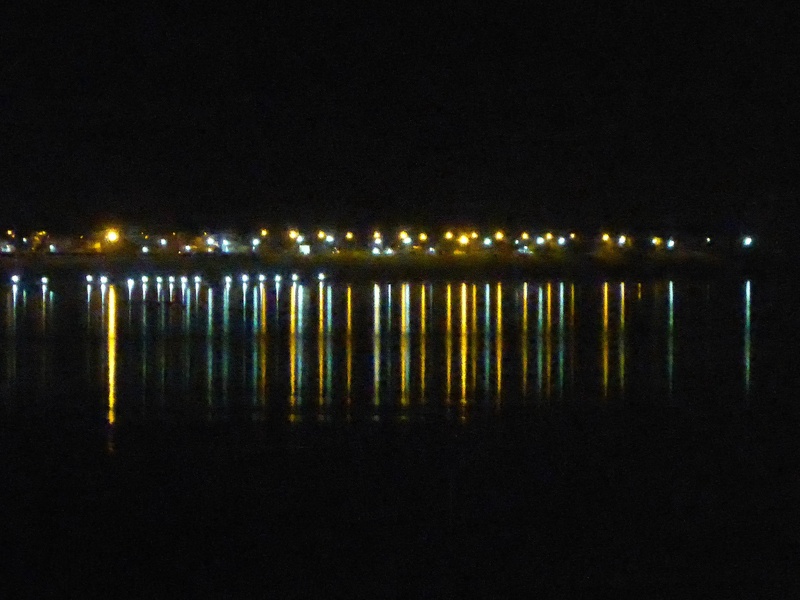 The streetlights across the river reflect into the Mekong. The vertical patterns that they make remind me of pictures I saw in Dallas years ago of a business associate’s children’s DNA that he had made into pictures. I guess as we are now older and have more memories everything new that we see and explore has the potential to be linked to something in our past, interesting thought. Vientiane has turned out to be a relaxing city, not too big with a population 200,000 at the last census in 2008 and easy to get around. Our first experience of the city was driving in from the north. 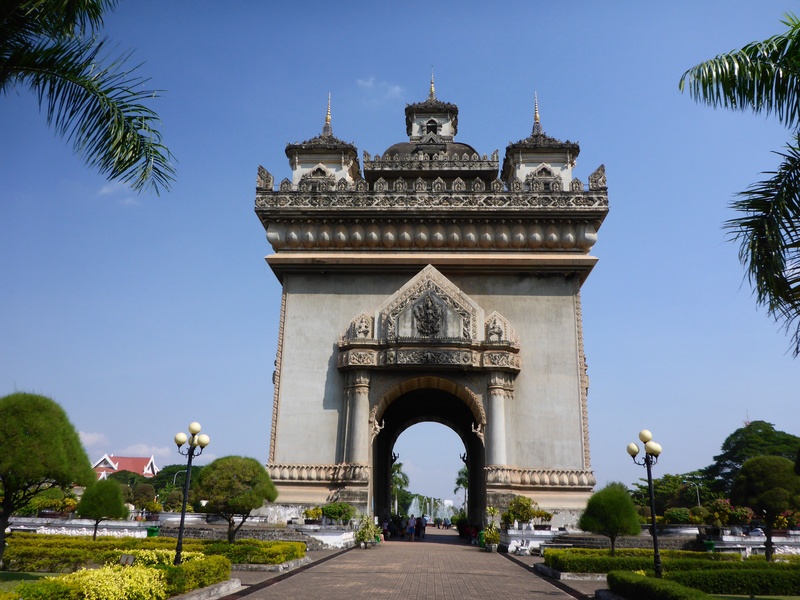 Normally we have found that as we enter large cites or capitals such as Vientiane, roads widen with extra lanes added and an impressive approach is created. We find none of this and speculate that the nature of the mountainous terrain to the north means that the small population, which the available flat arable land supports, does not warrant such an approach road. 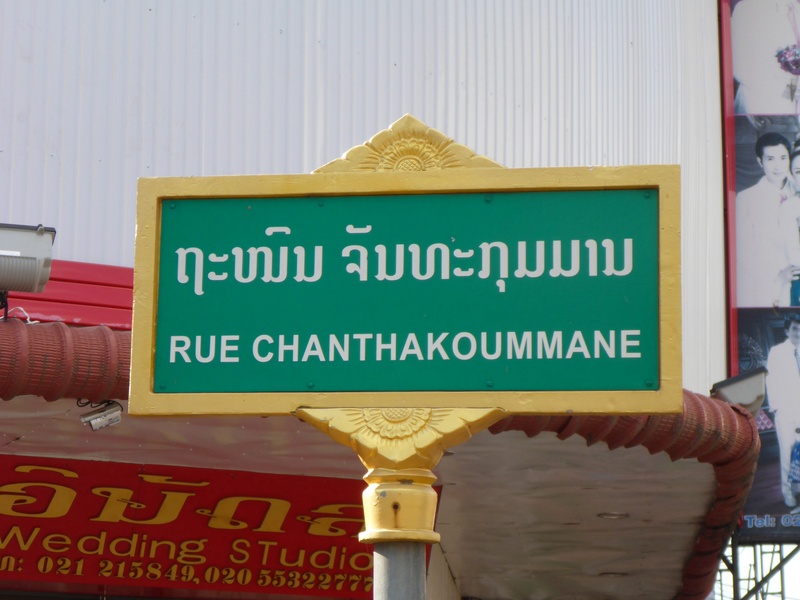 I think this was confirmed on our departure to the south and the large wide highway we discovered as we headed to Thailand. Our hotel, close to the river is excellent and reasonably priced. The benefit of the internet and the time others take to record their experiences allows a much easier selection of accommodation that meets ones own criteria. In our case, clean, quiet air-conditioner/fan and en-suite. In the past, verbal recommendations and much walking were involved in securing appropriate accommodation. Of course it should be noted we had less money and therefore were less fussy in our youth. We found a large variety of cafés and restaurants including a couple of Scandinavian bakeries alongside the usual French ones. It is always interesting to see what businesses become established for tourists or expats as we travel. One thing we have noticed here is the lack of parking for cars. The plethora of mopeds, scooters and small motorcycles can be catered for, but cars just park on the pavement/sidewalk making walking some distance almost impossible. 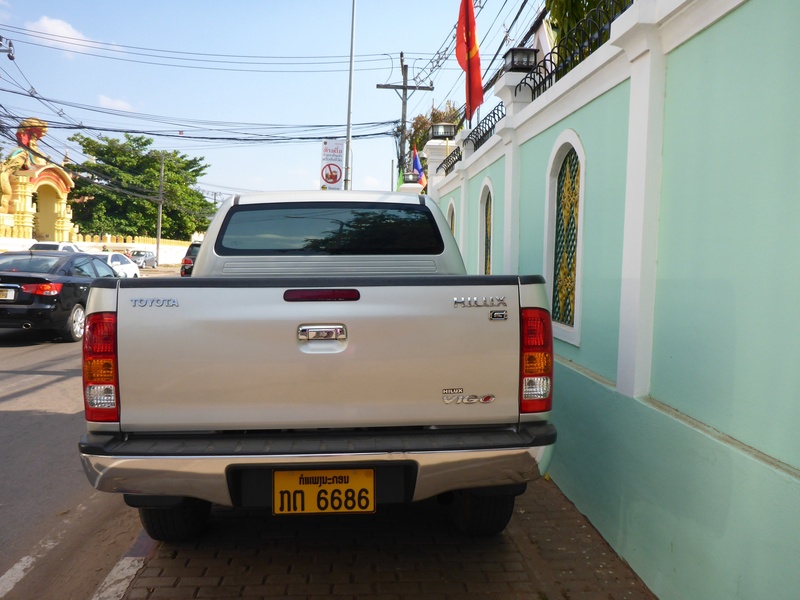 Most people use their two wheeled transport or tuk-tuks to get around. The exception to this is the road and walkway along the Mekong river, which is turned into pedestrian only access at dusk. The area is then filled with locals, walking, cycling, skateboarding and even dancing as the sun slowly sets in the west. 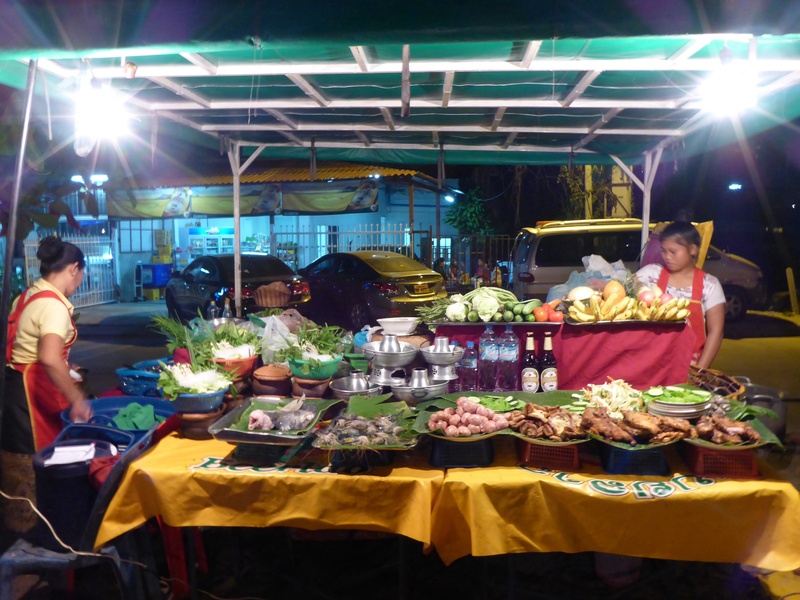 A large market also springs up each night with hundreds of stalls all aimed at the locals, not us tourists. 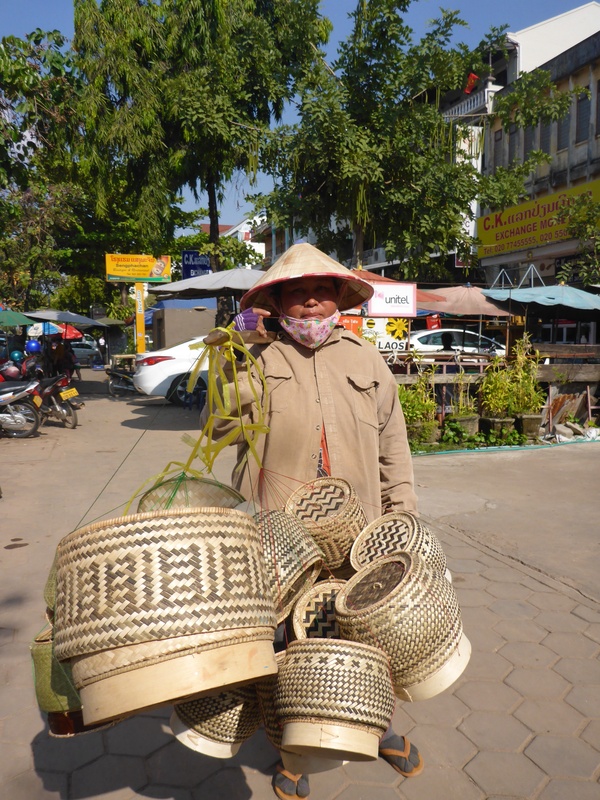 As in the rest of Laos there is no pressure from vendors and touts trying to market their wares. We have considered the possibility based on our observations that the harder life is, the more desperate people are to sell and what role if any does culture play. Any thoughts on this? While the areas we have visited in Laos have been unaffected by war in recent times, large swathes of the country still suffer from the effects of unexploded munitions dropped from the mid 1960’s to 1973. The needs of those injured have been met by Cooperative Orthotic Prosthetic Enterprise (COPE). While COPE grew out of the needs of those injured by unexploded munitions, their scope has grown to now cover those with disabilities from other causes. The museum has a stark reminder of the damage and suffering that is caused by war, but also showed people’s ingenuity in using parts of the munitions for making everything from scythes to storage containers. Well worth a visit. 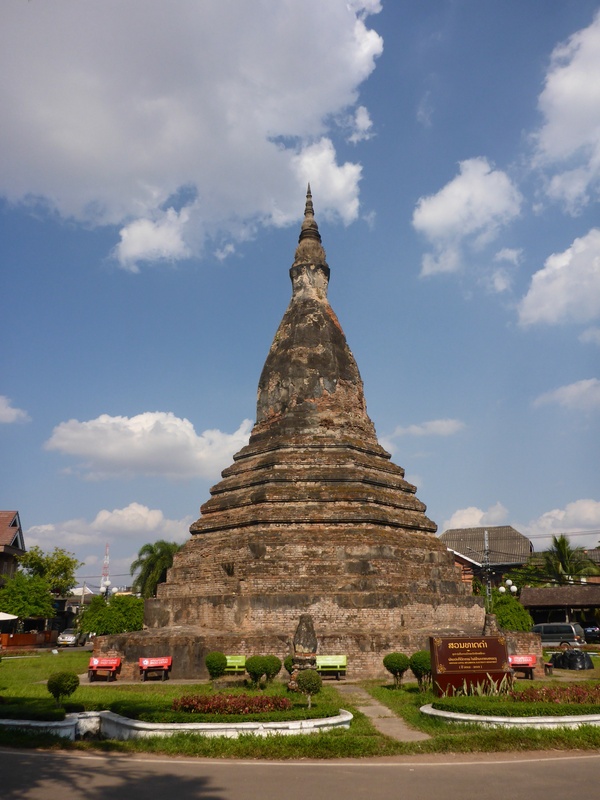 We arrive at the Great Sacred Stupa (Pha That Luang) just after 16:00 to find it has closed. The sun is slowly going down and the golden glow of the setting sun is reflected back from the stupa with increasing intensity as we stroll around the quiet complex. The tourists have left, vendors are packing up the remaining stalls and chatting to tuk-tuk drivers that missed out on the last fares back to the hotels. 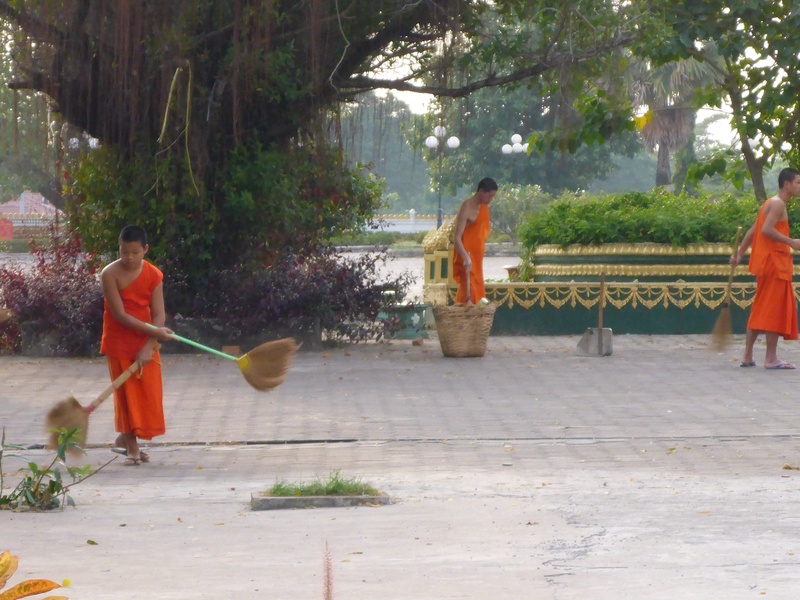 The tranquility of the moment is echoed by the rhythmic shushing sounds the monks’ brushes make while sweeping leaves from the square around the stupa. Again we are lucky with timing even though it was not planned. 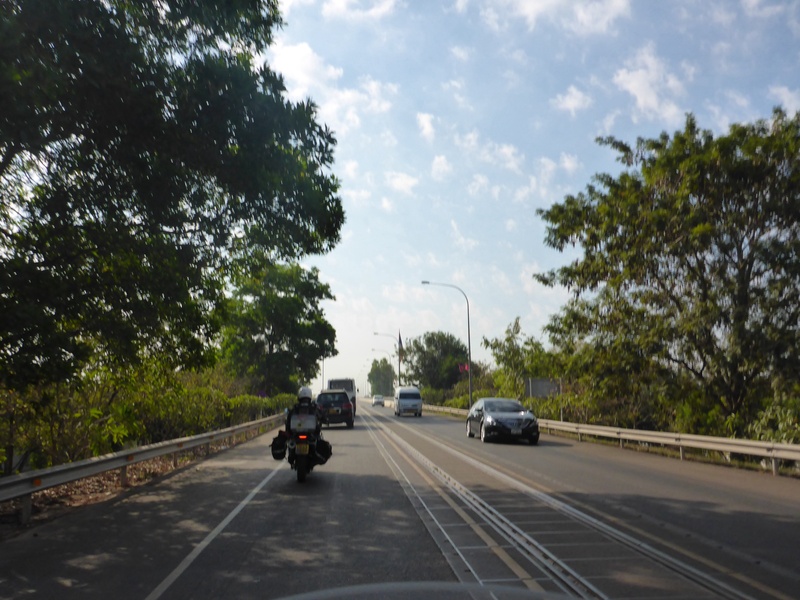 Crossing the Mekong, again for the second time brings us back to Thailand, see Visas and admin as usual for details, and we ride past Nong Khai recalling our first and only live kickboxing match we have seen back in 1986, before we even set foot in Australia. We are heading south and towards home, we are both looking forward to that. We have been travelling and living on the road for some 14 months and the break for a month at home in Australia is going to be most welcome. Simply excellent. Look forward to seeing you both in BNE. My life looks so dull! Thank you, Sure that is not true. Remember the posts don’t contain all the mundane things we have to do regardless where we are in the world. See you in January. Thanks. 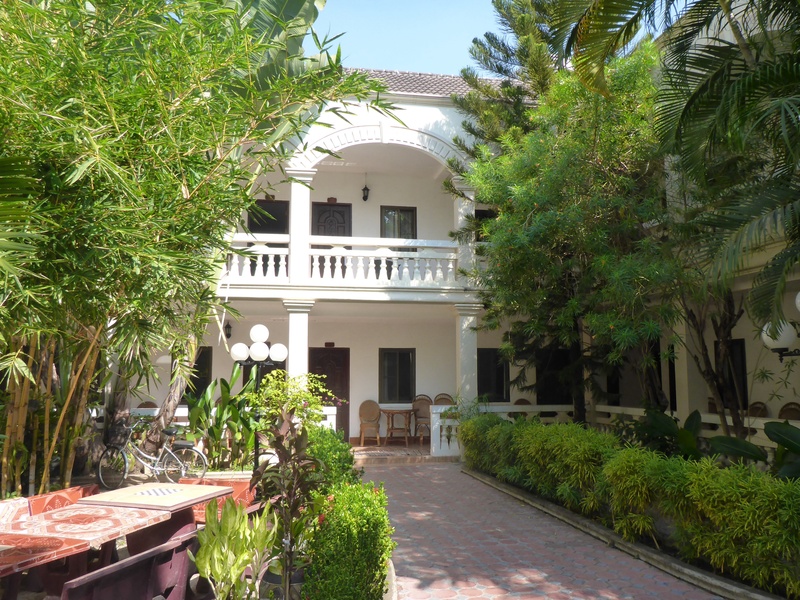 I am sure your friends will enjoy their time in Laos. Would be an opportunity for you both to see the region an Jeremy probably has contacts in the area. Remember in Paderborn you cannot bring Samuel back with you. Glorious sunset and an amusing take on the Arc de Triomphe. I don’t think there is any one answer to your query although part of it might be found in local culture, as you suggest, in indoctrination and, in areas where there is access to mass media, indiscriminate viewing making all actions seem normal. I think local culture is responsible. Interesting to understand how the cultures developed and what elements give rise to what we have experienced. In catch up mode again as I prefer to linger longer over the blog and savour the photos… Timing in photography and in life is everything so you guys get both in sync so many times. 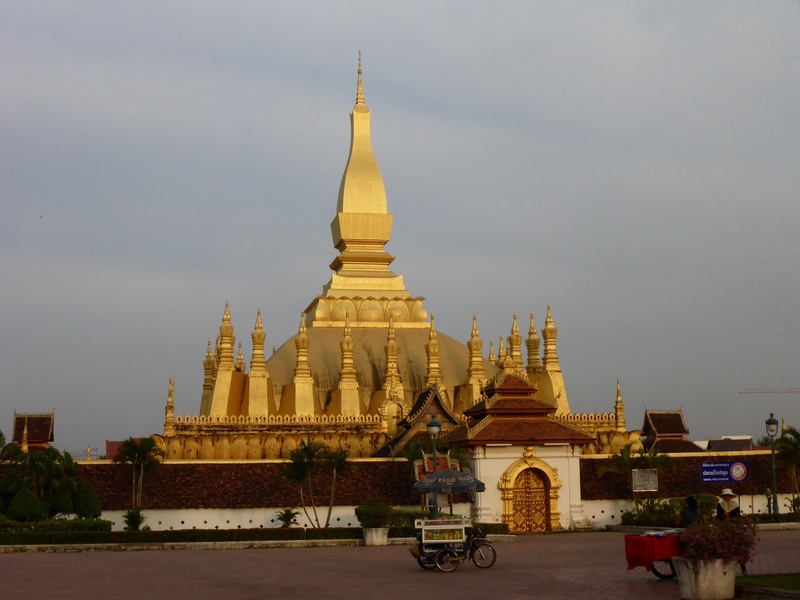 Never knew much about Laos so thank you for the photo feast. Love that you are creating connections with the past. Agree that culture explains a lot about norms in any society. However with modernisation I feel many cultures are losing the essence of their roots.